I see it often done by novices, heck, I used to do that myself. When writing a unit test for a method cloning an object, I would put an assertion to check that the original object is left unchanged. Well, that is wrong. This is checking against a possible bug in the implementation, in which the original object gets modified. But this is just one thing that could go wrong. There are infinitely many possible bugs like this, maybe even one that causes your machine to explode. You can't write assertions against all of them, so don't do it against any of them. It has two advantages. First is that you stop worrying you forget assertions against some possible bug; that is, if you were worrying about that in the first place. I am sure there are people out there who feel bad about not testing against printing foul language. Second is that the tests themselves become smaller, focused on the positive behavior, therefore easier to read. In the specific example of cloning: check that the cloned object is equal to the original but they are not the same objects, and that is it. Nothing else. Unit tests are positive tests, they should only test what you want the code to do, not what it shouldn't do. I am not sure about the case when we fix a defect, but probably a functional test for the defect is enough. Few are aware of the fact that gvim can generate html for the code inside the buffer. The command is :TOhtml; just type it in, and the html will promptly appear in a split window. In the browser, the generated html should look exactly as you see it in gvim. By default it generates html that should work in old browsers too, but can be told to generate CSS stylesheets or even xhtml. Type :help TOhtml for more details. 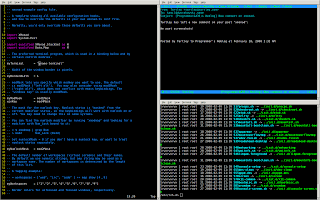 It works only in gvim, though; not in vim. It is handy for posting snippets of code on the web. Source code for .NET Base Class Library has been made available for debugging sessions in VS2008. It would download one file at a time as they are needed. Since then John Robbins and Karem Kusmezer have create a tool to download all the source files without hassle, great work! The tool is NetMassDownloader. I executed in in Windows XP as a limited user and have seen numerous failure messages printed out. Nevertheless, 120MB of data was downloaded and I had all the files I wanted. The authors advise though to run it as a privileged process (at least on Vista). The most interesting parts are bcl/redbits/ndp/clr/src/BCL/System and bcl/redbits/ndp/fx/src where bcl is the name of the directory you provided after -output switch. Together they are about 75MB. It was pretty interesting to read the implementation of the classes I had been using for so long: String, Hashtable, Arraylist. They are easy to understand, with lots of comments, and of course in C#. The classes I have read are all pretty basic and no wonder there are lots of pointers and calls into unmanaged code, but it is still readable. One surprising thing, but obvious after knowing it, is that " s ".Trim() will not create a new string "s", but return a slice, an object that holds a reference to the original string and knows where are the beginning and the end. This is possible thanks to the immutability of strings. I bet the substring method is implemented like this too. There are also some monster methods to be seen. One example is internal HttpListener.HandleAuthenticate spanning more than half a thousand lines. BTW source code for mono is available at mono-project.com/AnonSVN. Source for mono's BCL is under mcs/class/corlib. It might be interesting to compare the two. This blog entry contains notes on debugging memory problems in an IronPython application on Windows. I also provide scripts that are helpful in the process. I should also mention that it is specific to IronPython 1.*. The Debugger I was using is windbg.exe. It is a GUI application, but feels more like a command line. It is certainly more powerful than Visual Studio Debugger. First thing after starting windbg should be loading SOS.dll, which is an extension to windbg providing commands specific to debugging .NET apps (all starting with !). There is !help command that provides description for these commands (invoke after loading sos). If you have problems it might be because of the wrong sos.dll version. There is a different version for each .net runtime. Since IronPython runs in .net 2.0 you need sos for that specific version. You can find it in the .net sdk directory and specify the full path for the load command. Windbg can attach to a process by id (F6 shortcut, but there is also a menu item for it). From that moment on, the debugee is freezed until you detach from it. Next thing is to find objects that leak. In our case the biggest ones were Dictionaries so it was enough to just list all dictionary objects. Sometimes it is unclear which objects leak, this blogpost suggest a strategy for finding out leaking objects. For this task you will find the dumpdiff.py helpful. This following listing shows output of !dumpheap command the heap with given substring in the type name. This is always the first command after attaching to a process. Now copy one of the addresses and issue gcroot command to find some of the chains of references holding the object alive. I'll take the last address. It is worth mentioning that 24b496a0 points to an array that holds the entries of the dictionary. The previous listing shows only a fragment of the output of the !gcroot command. Arrows indicate directions of references. In the output of !gcroot command, the root (a static object or value on some stack) will be at the top whereas the object you invoked the !gcroot with will be towards the bottom. Python is a dynamic language and that makes it more difficult to debug IronPython than C# for example (with windbg). There are two problems. Firstly, types defined in IronPython appear under windbg as Unloaded Type. Even if the type names would be shown (no clue why they are not), they would be C# types (or should I say .NET native types) like OldType and UserType: the guts of the IronPython implementation, not the classes defined in our IronPython code. Secondly, the attributes of an object are not fields. They are stored in a dictionary, and to make things worse, that dictionary is not keyed by strings but by SymbolIDs. Somewhere in memory lies a table containing strings to which SymbolIDs hold indexes. To find out the attribute name or the type name there are many commands needed. I have created two scripts to automate it. Explaining the windbg scripts is out of scope for this entry, but I think I will post about it soon. 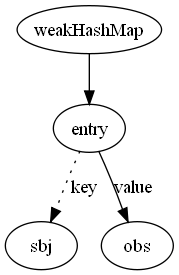 The first script, attr, takes two addresses as arguments, one to the array holding the dictionary entries, second to the value of the attribute, and prints the name of the attribute. Below I include the same fragment of the gcroot output plus example use of the attr. It will display the name under which 186787d4 is kept in the __dict__ of 13ab6360. Note that I pass to attr the address of the array not 13ab6360. The above listing assumes you save the attr script in c:\path, and the dollars are required, pounds will not do. Make sure you invoke it giving an address of a dictionary entry array keyed by SymbolIds like in the above example. So the above gives the name of one attribute. To get more attributes you can invoke !dumparray on the entry array, which will display all the values there which you can then check individually with attr script (or write another script to automate it ^^). The attr script may not work if the executable you are debugging is running from a path that contains spaces. There is one constant in the script that would have to be increased to make up for that additional space. The next script is less reliable that the first one, it worked half the time I invoked it on a Unloaded Type object. I think it works for UserType, so I named it usrtype. It takes just one argument which is the address of an object and returns the name of its Python type. I again assume you have it saved in c:\path. Now the most frequently used command, !dumpobj. It displays the values of the fields of an object. Of course it displays only the fields defined in the .net class. It knows what the object's type is, because each object on the managed heap has the pointer to its type in its first 4 bytes (or 8 if it is 64 bit machine). Since all the leaking I was chasing ware caused by design flaw in implementation of events in IronPython, I usually looked for object of type ReflectedEvent in the chain displayed by the !gcroot. ReflectedEvent stores the name of the event. It was usually also useful to inspect the IronPython.Runtime.Calls.Method further down the chain, from which you can get the name of the method handling the event as well as the class this method is defined in. So you got rid of the memory leak, but how do you test that it is gone? I mean an automated unit test! WeakReference will allow GC to collect the object, and after collection it will answer if the object was garbage collected. The del obj line is very important, ware it not there the test would have no chance of passing. Let's say you suspect that some object is not being garbage collected, and its class is defined in Python. Because of the dynamic nature of Python, its class is not represented as .NET type, hence you can't simply find it with !dumpheap -type <type_name> command. My mother works in laboratory, when she analyzes samples, she sometimes marks them with special substance to make some elements stand out. You can mark Python objects in a similar way. GopherStyleUriParser is a good enough mark, there is low probability you will have a second one on the heap, and because it is .NET type you can find it easily with !dumpheap -type Gopher. Then invoke !gcroot on it and you will find that the chain goes through your object. Update: Previously I was recommending using ArithmeticException instead of GopherStyleUriParser for the tag; don't do this. As soon as you would get rid of the other leaks, the object would be kept alive by the instance of ArithmeticException, which captures the stack trace. That one is a dirty hack. All the trouble I had with memory leaks were because of the events, how about nuking them? The reason the IronPython team didn't just use the .net implementation of events was that they wanted to allow removing handlers by object equality, rather then by referential equality. By referential equality I mean comparing objects' references (is operator in Python). So how about defining an object that is equal to everything? That is a very fine fellow, which we can use to get all the handlers out of an event. Ok, that will kill at most 100 handlers, but there is no way you can find out how many there are. And not, it will not throw an exception if there are no more handlers. If I remember correctly from looking at the implementation code (open source is great), there are some exception being thrown under the hood, but are swallowed higher up. This makes the operation costly if there are no handlers, as the exception in .NET are much more expensive than in CPython. I thought that finding and stopping the leaks would be easy, but it took many days. Perhaps fixing the IronPython implementation could have taken less time. Anyway, if you think that the bug should be fixed, please vote for it. It was given a low priority and it is not easy to do, so without votes it might not make it to IronPython 2.0. I have just read the Arc tutorial. Here are some comments. I know this feature from Nemerle, and miss it when programming in other languages. Another nice one seems to be ~ operator for negating a function, though would not be nearly as useful as the last one. Resolver One, a new MS Excel's alternative, is currently available in two versions. First is a vanilla commercial one, whereas the second, Resolver One - Non-Commercial, requires a bit of explanation. Resolver One - Non-Commercial is free (as in beer). Internally at Resolver we used to call it Resolver One for Open Source. Not because it comes with sources, because it doesn't, but because it could only be used to produce open source. Since then we have further relaxed the license to allow personal use. What a user gets after installing Resolver One Non-Commercial is feature-wise the same application as in the commercial one, but with a different license. The license requires the user to make his spreadsheets open source or mark them as personal -- not for redistribution and profit. Technically, the Non-Commercial version will not save the spreadsheet file until user decides on a license for his spreadsheet. When he tries to save the file for the first time, he will be presented with seven well known open source licenses to choose from (MIT, GPL, Creative Commons, ...), but he can also mark it as personal. If he selects one of the open-source licenses, it is included on top of the code part of the spreadsheet, making his spreadsheet free (as in speech).